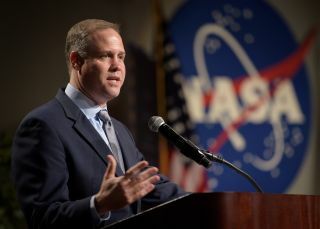 Jim Bridenstine has led NASA since April 2018. WASHINGTON — Spaceflight has changed immensely over the past half century, with the differences highlighted by the contrast between the Apollo program's feverish push and the fitful discussions and abandoned moon missions of recent decades. Space.com: Given the 50th anniversary of Apollo 8, in particular, and your role now leading the charge to return to the moon, what's this like for you? Jim Bridenstine: Well, it's pretty amazing. Back then, on Apollo 8, the risk was very, very high. … And yet the intelligence said the Soviet Union was going to go to the moon by the end of the year, and so NASA made very aggressive plans, even risky plans, with the intent of beating the Soviet Union to the moon. The risk was very high — they intentionally dropped the lander — the lander of course is the lifeboat. But at the time, in this contest of economics and politics and technology, it was sufficiently important that NASA was willing to take all of this risk. … The good thing today is it's all been proven before. We have the miniaturization of electronics, and we have reusable rockets, and we have commercial partners, and we have international partners, which we didn't have back then. … We're in great shape today because they blazed the trail. … And so what we can do today at the moon is very different than what they were able to do back then. Back then, it was just a test of technology, economics and politics. Today, it's a test of, really, international leadership, leading a coalition and doing it in an international way so that we can build goodwill and take humanity farther than it's ever gone before. It's really all built on the back of the Apollo-era astronauts, technicians, engineers [and] scientists, and I'm thrilled to be at the helm of the agency at a time like this. Space.com: The tone of how we talk about going to the moon also seems very different. What does that mean for exploration in the bigger picture? James Lovell and his Apollo 8 crewmates, William Anders and Frank Borman, as seen a few months before their historic trip to the moon. Space.com: How does the Apollo 8 mission in particular and the Apollo program more broadly resonate with you, especially as someone who didn't have that pivotal moment growing up watching it play out in real life? Bridenstine: It's a big deal. I'm the first NASA administrator that was not alive when we landed on the moon. Some people suggested that that means I'm not qualified to be the NASA administrator. I would argue, no, I am qualified, because my generation is the one that missed out. My generation is the one that doesn't have that moment where I remember exactly where I was when Neil Armstrong and Buzz Aldrin first walked on the moon. We need to re-create those stunning achievements and those good moments where people remember exactly where they were when those stunning achievements were accomplished. I remember in fifth grade right where I was when Miss Powers came into my fifth grade English class crying. She came in crying because of the Challenger explosion. … I remember exactly where I was. It was a big impact on my life. Then, I remember being on the aircraft carrier when the Columbia incident happened. Those are the space memories that are seared into my memory, [from] long before I was ever the NASA administrator. My generation has those moments. My generation does not have those moments of goodness when we had three astronauts orbiting the moon and broadcasting on Christmas Eve, where one out of every four people on the planet heard their broadcast, which was Apollo 8. We don't have that moment where we saw Neil Armstrong and Buzz Aldrin walk on the moon for the first time live on television. One of the things that's important to me, that should be important to all of us who weren't alive at the time, is we need to get back, and we need to make sure that we're raising up the next generation of scientists, technologists, engineers and mathematicians so we can continue to do stunning things.